Well, by the time you have progressed past a first draft, a second draft, a final draft and have revised a final script twice, there is very little that is going to be different when filmed. You may simply drop a few lines and a scene or two to come in on time. Nothing major is left to change. Thats the case with this script. A line or two here (Kirk compares Deneva to Hawaii and Paris), a scene there (Kirk interrupts Spock to check up on how he is dealing with the pain as Spock retrieves a creature from the surface for study), about covers it. 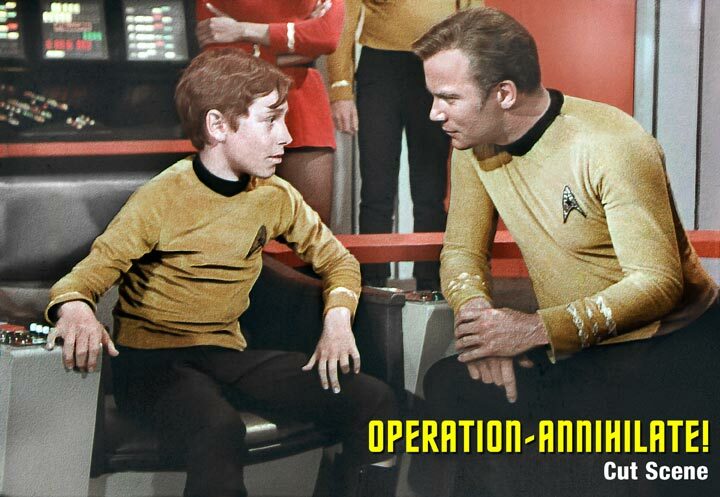 After identifying his sister-in-law as Aurelan, Kirk thereafter calls her by the diminutive "Lani." Most of us are quick enough to realize it is taken from the last three letters of her name, but I imagine it was decided that some would not get it. Thus, in the episode, Kirk only refers to her as Aurelan. In Act Three, we have several small bits excised; most of these are extended technobabble conversations about the creatures communal mind, and more speculation on how flying into the sun freed the Denevan from his parasitic invaders. Dropped, probably for time, but maybe because it made Kirk, Spock and McCoy seem just a little too dense. It is only after the second time it is brought up that they speculate the Denevans recovery had something to do with the properties of the star. to Earth to live with your grandmother? is the best place in the whole galaxy. and his wife always wanted a boy. No one ever is, Petey. you in the Transporter Room. The boy formally shakes hands with Kirk, exits to the elevator. The Engineer moves in beside Kirk. later on, sir. Looks like a bright lad. I hope he decides not to. to ever have to make that choice. Most fans seem to express relief the scene was not aired. Well, given the famous still with Kirk and Peter above, I really cant condemn the scene without having seen it play out. It would all hinge on Craig Huxleys performance. The latter bit between Kirk and Scotty would have been excellent, no doubt. For two men who did not get on well, Shatner and Doohan had the most marvelous on-screen chemistry. Not a great episode, but not a bad little riff on Robert A. Heinleins The Puppet Masters.